It is very simple to make a dancing led circuit with ne555 timer ic. We can make this circuit very easily at home. It takes only a few minutes to make a dancing led circuit. We can add enough led in this circuit indeed of our need. You can also be able to use this led dancing circuit as a led moving signboard. So, we should go to the practical to make this dancing circuit. For Making a dancing on/off led we need some passive components. 5v battery or dc power sources. Now, connect all the component as like as the circuit. After all you should give the power sources in your component. 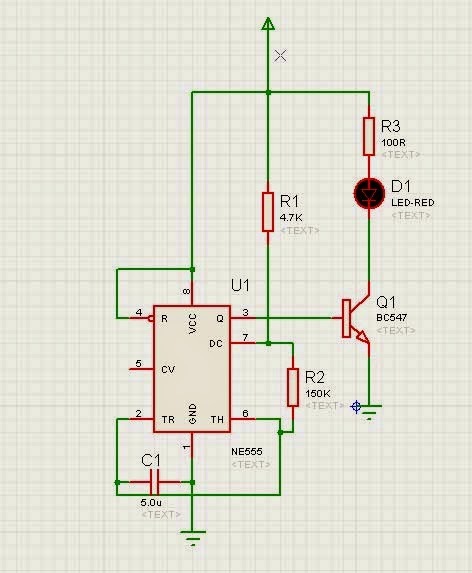 You should use 5v dc power source in this circuit. If you can make all things as right way you are success. Now Play your circuit. You can change the number of led. But you should connect all the led as parallel of 1st led. Do you want to build a laser security system at your home? Than read this article from the link. If you don't understand anything you can comment below. Thank You.